Will You Survive in Zombieland? If you just had a horrible day and need a good pick-me-up movie, or you just have this strange fascination with zombies, Zombieland is exactly the right movie for you. Directed by first-timer Ruben Fleischer, this movie tries to strike a balance between comedy and gore. That is, if you consider watching a zombie devouring a victim gorier than it is purely repulsive. But you can expect to see blood, bile and twisted body parts. Lots and lots of them. 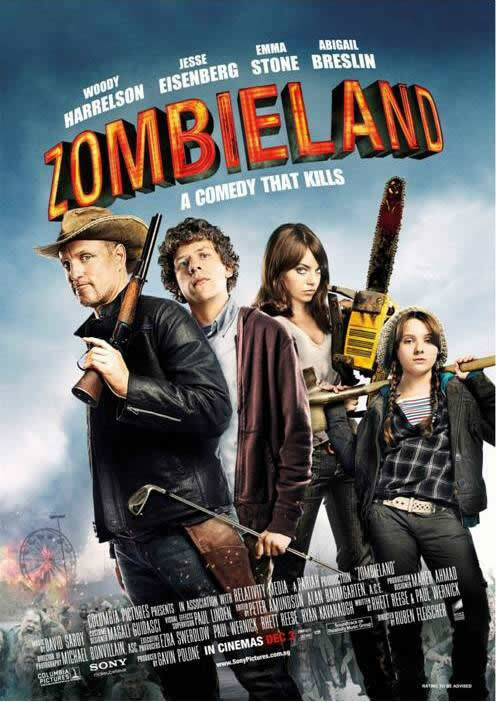 Zombieland tells the story in the point of view of lead character Columbus (Jesse Eisenberg): a paranoid, geeky college student who happens to be one of the remaining survivors of the zombie apocalypse. How does he do it? By carrying a pocket-sized notebook which doubles up as his very own survival guide. These rules that he conscientiously follows include always checking the backseat of a car, putting on the seatbelt before moving off and “Always double tap” which means shooting twice to ensure that the zombie doesn’t get back up. On his way to Columbus, Ohio, to meet his family (hence the nickname), he hitches a ride from Tallahassee (Woody Harrelson) who has this bizarre fixation with Twinkies. While on their mission to feed Tallahassee’s Twinkies addiction in a deserted supermarket, they meet Wichita (Emma Stone) and Little Rock (Abigail Breslin); 2 crafty sisters with trust issues. After several initial conflicts, the 4 characters finally decide to head to Pacific Playland together, where it apparently is zombie-free. They make a pit stop at Bill Murray’s mansion where they meet the fifth survivor of the apocalypse, Bill Murray himself. The scenes from the mansion, albeit the fact that they could’ve been made shorter, I feel were most engaging. Apart from the hilarious jokes and references to Bill Murray’s movies like Ghostbusters and Garfield, the scenes portrayed sides of the characters that you’ve never seen previously. The casts were amazing, especially Woody Harrelson and Abigail Breslin. Woody fits the role to a T with his sardonic sense of humour and he conveys his character’s lines and personality with sincerity and perfection. Abigail, fresh from her character as young and innocent Anna Fitzgerald in My Sister’s Keeper, took on her role as Little Rock excellently. She was so convincing that it wasn’t weird how the same girl who drove the audience to tears in Jodi Picoult’s bestseller was now wielding guns and firing them at zombies. Save for the predictable plot and the cliché ‘Beauty and the Geek’ love story between Columbus and Wichita, Zombieland is a great horror-comedy, just not so much on the ‘horror’ part. The ending at Pacific Playland was a tad disappointing as it was too predictable but the jokes and sarcasm throughout the entire movie made up for it. Go just for laughs, and if you can’t take shock, violence or blood very well, please skip the popcorn.